Here in Argentina the Future wax doesn´t exist with that name. The substitute is Blem Acrilic Floor´s Bright (Blem Brillo Acrílico para pisos). It isn´t the same product but it works the same. I only apply it with a soft flat brush, never with the airbrush. 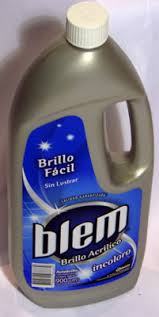 This is the product here in Argentina.